I’ve said it before, but this pizza is seriously AMAZING. I created this recipe out of sheer laziness because I needed a last minute dish for a July 4th potluck that could be assembled very quickly. At the potluck I cut up an entire giant watermelon and I’m telling you, those slices FLEW. OFF. THE TABLE. At least nine people asked me for the recipe, two people even chased me down with a notepad so that I wouldn’t forget to give it to them. The combination of the bright and zesty dressing, the crisp watermelon, sweet blueberries and smooth creamy mozzarella cheese is to DIE FOR. This is one of those dishes that looks totally crazy but makes so much sense once you taste it. The key to a successful watermelon pizza is making sure that you’re using really high-quality ingredients. Because this is a raw pizza, you’re going to be able to tell the difference between organic and non-organic, local and outsourced, etc. This one looks crazy but trust me, make this pizza right now. Like, close your laptop and go make this and then come back and thank me profusely later. Slice the watermelon wedges in 1-inch slices and then cut each slice into six wedges (like they’re “pizza” slices). Set aside. To make the dressing: Chop up most of the basil leaves (leave a handful for the topping) and put them all in a mason jar. Add in the EVOO, squeeze in the lemon juice, honey, kosher salt and crack in some black pepper. Shake the jar until it’s very well combined. 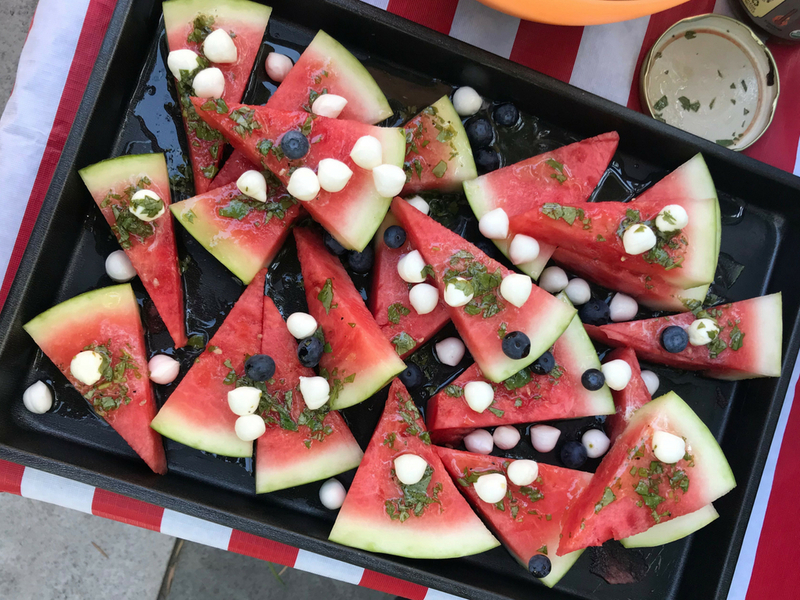 If you’re prepping these ahead of time, wrap up the watermelon and put it in the fridge so that it’s extra cold and set the dressing aside. This will keep up for 8-10 hours (or overnight). Because the melon is so juicy, it will fall apart quickly so it’s important to assemble the pizzas at the very last minute. To assemble the pizzas: First, lay out the pizza slices on your serving platter. Top each slice with about 2 mozzarella balls. Drizzle a spoonful of dressing on each slice. Pile on a few blueberries on each slice. For a final bit of freshness, tear the basil leaves over everything so each slice has both some dressed basil and fresh basil.